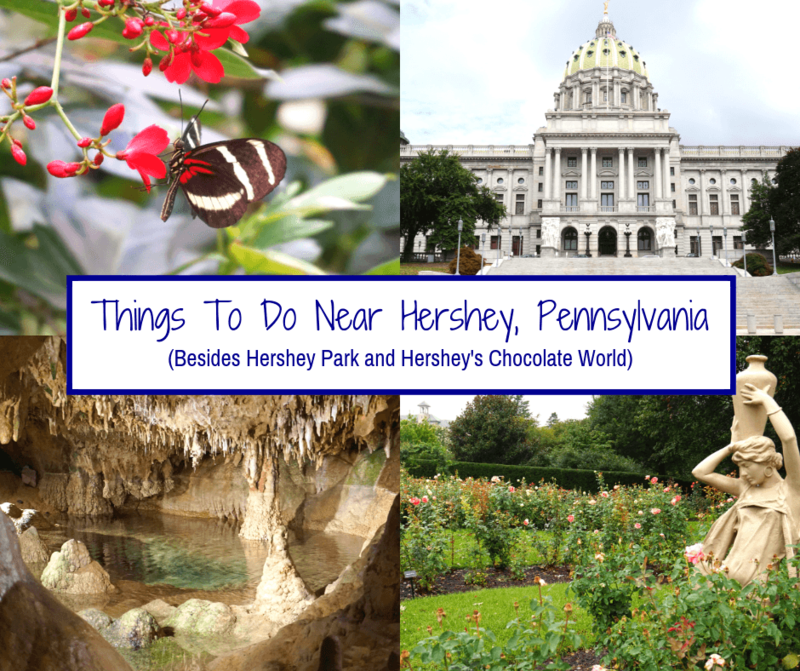 Looking for fun things to do near Hershey, Pennsylvania? We’ve got a few recommendations and they’re all within 30 minutes of town. Besides Hershey Park and Hershey’s Chocolate World, you may be wondering if there are any other fun things to do around Hershey. And the answer would be yes! In this post, we’re highlighting nearby attractions that will spark imagination and curiosity. If you’re looking specifically for things to do near Hershey Park (maybe a someone in your group isn’t a fan of roller coasters), we recommend visiting Hershey Gardens. The gardens have been open since 1937 and are on 23 acres of land. Visitors will find all kinds of beautiful flowers and plants spread across various themed gardens. There is also an indoor butterfly atrium, where you can see hundreds of butterflies from around the world. Hershey Gardens also has different exhibits and shows throughout the year, so even if you’ve been there before you’ll most likely enjoy something new. It was a bit rainy during our visit, so we only went to a few of the gardens, but what we saw was beautiful. And the butterfly atrium was fun and a nice respite from the rain. The gardens are open daily at 9am (except for some holidays) and closing times vary from 4pm to 6pm depending on the season. Admission for adults is $12.50. Active duty military members enter for free while spouse and children receive $3 off. There are hundreds of butterflies! Another one of the fun things to do near Hershey is to visit Indian Echo Caverns. These caverns are just down the road from Hershey, in Hummelstown. They have been open commercially since 1929, but had been used for centuries before that by Native Americans and early settlers. The caves have been carved out of limestone and inside the temperature is a constant 52° year round. Visitors can take a tour of the caverns that lasts about 45 minutes and is given by a professionally trained guide. Inside, you’ll see a lot of really cool formations and small ponds. Indian Echo Caverns hours vary by time of year. From Memorial Day to Labor Day they’re open from 9am to 5pm. The rest of the year their hours are from 10am to 4pm. They are closed on Thanksgiving, Christmas Day, and New Year’s Day. Admission for adults is $18.50. You can really enhance your cavern experience by buying a helmet! We also recommend heading over to state’s capital of Harrisburg. It’s about a 30 minute drive, and you’ll find fun museums, great food, and one of the prettiest Capitol buildings we’ve ever seen! Pro Tip: Learn more about Fun Things To Do In Harrisburg, Pennsylvania. As you can see, there are plenty of things to do near Hershey! You can get your fill on chocolate and roller coasters, but also enjoy nature, history, and culture. The Indian Echo Caverns look amazing! I didn’t expect for something like that to be in that area. Kudos to you and you’re research skills. You have identified some good spots to visit. Hershey Gardens is gorgeous Vicky. Talk about a proper garden. We loved it out there. I also enjoyed playing 9 on the golf course, although terrible LOL. Haha! I’d be even worse! And only 25 minutes from Hershey is beautiful Mount Gretna, Pa. A lovely town under the canopy of trees where Music, Art and History come together. A beautiful Gallery, The Gallery at La Cigale, showcasing the work of nine Resident Artists and many guest Artists and musicians thru out the year. A Theater, Ice cream shop, a linen shop, a souvenir shop, Restaurants and much more. The Harrisburg region is a secret treasure. It is definite a great city that is below the radar. Aye, central PA is a unique area. There’s quite a few spots within a half hour from Hershey / Harrisburg. If you go a bit of a ways further out, especially along the river to the river towns, it’s a trip back thru time. Going south from Hershey will take you to Marietta and Columbia, two of my favorite river towns in south central PA. Even Wrightsville on the other side of the river has an awesome place to enjoy a summer night, John Wrights Inn with good music, beer, and pizza. If you got a whole day to get lost, you can go even further on the back roads down river to see where the fishes said to the wall, Dam! It’s not a common route but going north will find you winding your way thru the hills to the last running ferry on the ole Susie Q, Millersburg Ferry with the old school roadside diners and ice cream stands along the way.